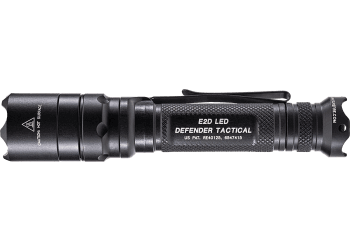 The E2D Defender® Tactical is a 1000-lumen flashlight featuring single-output capability and self-defense enhancements. 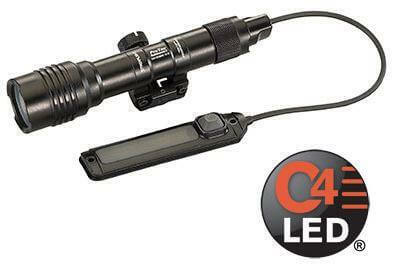 Utilizing a virtually indestructible high-performance LED and a Total Internal Reflection (TIR) lens, the Defender is activated with a push button tailcap click switch: press or click for a high-intensity 1,000-lumen white-light. The Defender’s crenellated Strike Bezel®provides further defensive options should the need arise. The machined aerospace aluminum body has a Type III MIL-SPEC hard anodized coating for durability and corrosion resistance. 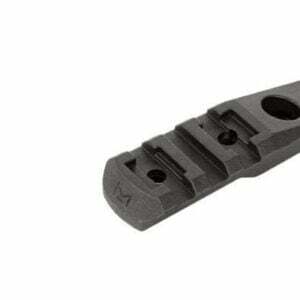 The bolstered dual-function pocket clip is best for bezel up or down pocket storage. 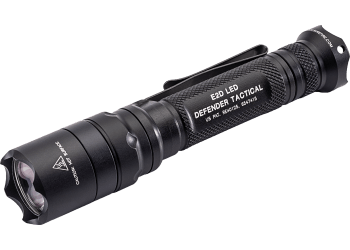 Slender and powerful, the E2D Defender® Tactical is an ideal everyday-carry light.